"If you want to kill me, do it in the tournament!" At the risk of sounding like a broken record, I'll say it again: films, animated or otherwise, based on video games, are a risky proposition and rarely go well. After all, who could forget the lurking horror of, say, Super Mario Bros.? Well, joining the ranks of such projects is Tekken, an attempt at turning a reasonably successful game into a deep and meaningful piece of anime which, when you're familiar with the game, makes little sense. It's also a good example of how anime has suffered poorly at the hands of Westerners desperate to make it so successful they alter the original film just enough to pervert it, but make it palatable to the inexperienced; a combination that disturbs me. While lately I've loved much of ADVs published works, some of their earlier efforts make me thankful they've changed their ways. The Tekken game series started about 1993-94 by my memory, and as a fighting game, was pretty streamlined in terms of story and design. You beat people up, end of game. The series continues even to this day, and not much has changed other than the technology and elaborate, often maddening, fighting moves you must master to win. The game's producers, Namco (the company that brought us Pac-Man), presumably thought an animated movie would make a load of money and be a perfect way to market something to a pre-established audience. Except, I'm still confused as to why someone would take a concept like Tekken, which is about fast, furious combat, and make a film with virtually no fighting at all. In fact, Tekken: The Motion Picture, has so little action, I was astonished it could be linked with the franchise at all. 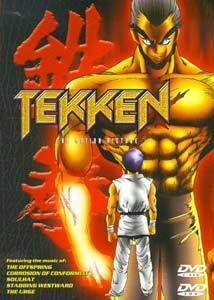 The story involves a government agent, Jun Kazama, entering a secret fighting tournament on an island controlled by Heihachi, a millionaire who's not only a powerful combatant, but also controls a secret lab where bizarre experiments are performed. Meanwhile, other fighters join the tournament to get back at Heihachi for various reasons, whether it be he looked at them funny years ago, or took his son and threw him off a cliff when he was a boy. Don't worry, the boy survived and became Jin, another deadly fighter out for vengeance. Fans of the video game will probably ask themselves,"So, where are the characters from the game?" Well, a few are in there, in roles that they never had in the original, but the most interesting and bizarre fellows from the game (like the robot, Yoshimistu, or the half-tiger/half-human wrestler King, or the living, wooden statue Mokujin) are totally absent, save for a few seconds worth of visual cameos. Tekken is 60 minutes long, and nearly half of it is spent on setting up the story and providing copious detail on the backgrounds of Jun and Jin. In fact, the same flashback sequence is shown about 4-5 times just to make sure we all get the point that Jin hates Heihachi. They all get to the island, there's some stuff about a double cross and how a mysterious female wearing an evening gown and carrying a rocket launcher will kill everyone and then proceed with "R-Experiment." Once the tournament kicks in, another subplot is unleashed about Heihachi making dinosaurs in his secret lab, which inevitably get released on the fighters and cause even more problems in killing off Heihachi. The plot plays out kind of like Enter The Dragon, if it had dinosaurs and genetic mutations. On top of everything, another subplot pops up about Jin being possessed by a demon, and yet with all this going on at once, I can't remember much happening that was too exciting. Despite all of this, there are actually some subtle but important differences in the language versions. The English version is not quite the same movie, which I will discuss in the audio review, and although I really did not like the original Japanese version, the English is so hilarious it qualifies as a separate experience. Among other things, the soundtrack is vastly altered so that, at key points, instead of the orchestral score, we get bands like The Offspring, Stabbing Westward, or whatever was 'in' at the time, blasting off the screen. Perhaps the funniest thing (no matter which version you watch) is that I could have cared less how any of this turned out. If Heihachi blew up the world and the film closed with a title card that said "THE END", I wouldn't have blinked an eye. After the giant dinosaurs showed up, I was pretty much convinced it couldn't get more ridiculous, and it really doesn't, which may be saying something positive about it. Even if you're terrible at video games, I'm convinced you could get more entertainment out of 50 cents spent playing Tekken 4 in an arcade than bothering with this interpretation. Image Transfer Review: On occasion, Tekken substitutes its normal animation for CG-enhanced animation, which can be a bit out of place, but it generally works. Both types of animation look good though, with some slight pixel movement in some scenes. A few moments have "ghosting," where pixels from a moving character will remain in one place briefly when they move, but it seems to only occur in the areas where the pixelzation occurs. Overall, the image is not quite as crisp as most of the anime released by ADV, but it's nothing shabby, either. Audio Transfer Review: It's rare that I come down hard on an audio transfer, but Tekken really disappointed me. Even though I hated the movie, I wanted to evaluate the audio on its own merits, but I couldn't really find any. To begin with, Japanese 2.0 audio is completely lifeless and flat. Other than a few musical portions, it's basically mono, and a very collapsed mix at that. It has no fluid, dynamic range and sounds seriously limited in both high- and low-end. Voices can be hard to make out against other sound effects, and anything requiring deep bass doesn't come across well at all; rather, very harsh and distorted. The English 5.1 basically expands the normal mix into the front 3 speakers (I don't remember any surround material), but doesn't compensate for the original Japanese problems. So, you get three channels of extremely harsh audio that lack depth, but on the opposite side of the original track, has too much bass. In fact, anything remotely bassy is charged into the subwoofer channel in such a way that the normal audio carries virtually no bass. This sounds very weird and seems designed to simply cause a lot of vibration and room shaking, to compensate for the lack of a true audio experience. The French track is basically comparable to the Japanese. Of course, one of the huge differences between the 5.1 audio and the 2.0 is that it contains a partially re-done soundtrack, mostly featuring all sorts of pop-rock bands that were big at the time of production. The dub is also one of the worst and most laughable I've ever heard. It has zero emotion or effort behind it, and the dialogue is a literal translation of the subtitles. Since subtitles are often very strict in following Japanese, it works when it's read, but not when spoken. As a result, some of the lines are delivered in such a funny manner it's almost worth seeing Tekken just for the dub. Assuming things are the other way around, that means the subtitles were actually inspired by the English voice script, which isn't a good thing, either. In all seriousness, though, this one of the few movies where I had a problem listening to any of the audio mixes, as none of them sounded even remotely good. Extras Review: The most prominent features on the disc would be the profile sections of the Tekken characters as well as a look at the English voice cast. The character profile gallery helps in straightening out many of the unexplained and confusing elements of the story, but not enough in my opinion. There is a gallery of photo stills and 2 promotional, ADV-made trailers for Tekken. Everything is rounded off with a whopping 12 trailers (including Battle Angel, Neon Genesis Evangelion, Slayers, Sorcerer Hunters, Burn Up Warrior, Dirty Pair Flash) and an additional ADV promotional spot (one of their "Do It Now" commericials). The presentation is nice, with some well done menus, but a few of them took a bit long to load, which may or may not be a disc-based issue. There is a DVD-ROM weblink that is supposed to take you right to the Tekken website, but I was unable to test it without a DVD-ROM drive. Tekken is described as "an adventure that will rip you right out of your living room and hurl you into the blood-drenched arena of the most incredible martial arts battle ever created!" That sounds awfully messy, so thankfully it's actually more like "an adventure that will sidetrack into something about genetics and dinosaurs that has virtually nothing to do with the video games!" Pass this one up; ADV has since published movies and series that are far more appealing and interesting. They also seem to have learned a great deal about the treatment of anime on DVD since this early effort, which I believe was their first disc.